This video is a quick summary of the document CONfinance, and the ways finance is provided. Is this a result of their education..? Are they aware of other ways of providing finance..? What if the only thing you shared with bank staff is the possibility of their being other ways to provide finance..? What if there were up to 22 different ways corporations could provide finance..? What if only one of those was by lending money..? How could a bank provide finance without lending money..? Visit Scott’s Site for more tools to assist you in approaching your bank. A friend of mine jut shared this with me “She has a neighbor who works for State Employees Credit Union in Raleigh, NC… she asked her if she knew the banks and governments had been foreclosed on? She said, “yes”. Then, my friend asked what they were doing about it. She said, :business as usual until otherwise notified.” This is why we need to continue to DO!!!!! Individuals are being USED in the system as usual. However, I hope this gives you peace in knowing that what has happened is TRUTH! I’m in I printed foreclosure fliers and am going back to hand them out at every bank in Denver. Just know that all this paperwork we are doing re CNs etc is an interim step toward our existence in the Golden Age as free beings and soon we will no longer have to play these paper games. In the meantime lets keep it up, ITS WORKING. Thanks to all who understand this, are active and participate, you are being and doing in alignment with the planets as we transition. The sun is smiling and laughing with your DNA. Check out the new OPPT-IN.COM site! Looks similar but has many new features and stories. Get involved and lets work together to change our world! [Español] Cada mensaje está publicado bajo una Categoría que se muestra debajo del mensaje. El nombre de la Categoría es el nombre del Tema. Para ver todos los mensajes de un TEMA, haz clic en la Categoría. [English] Each message is published under one Category that is shown below the message. The Category’s name is the Topic’s name. To see all messages under one TOPIC, click on the Category. El Fideicomiso Público del Pueblo (OPPT) es el Nuevo Paradigma de vivir libre. This comprehensive presentation about the One Peoples Public Trust (OPPT) (Rev 3.5) can be used for educating yourself, sharing with other individuals, or make a professional presentation to large groups. I promise you, you’ll look like a professional! If anyone has questions, direct them to the references and tell them, DO THE RESEARCH! It also includes information and links to the various Courtesy Notices that are used to alert others to the changes in the lawful landscape. 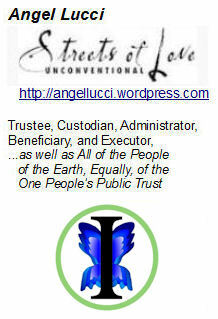 The One People’s Public Trust has created and filed legal documents based on The Law of One, Universal Law, and UCC law. It states, in effect, each Hue-man is a manifestation of the Creator Source, and as such is a Creator, and is NOT subordinate to any artificial principality or corporate fiction. OpenOffice Master (Rev 3.4) Presentation available to anyone desiring the presentation for translation into other languages. This presentation about the One Peoples Public Trust (OPPT) can be used for educating yourself, sharing with other individuals, or make a professional presentation to large groups. I promise you, you’ll look like a professional! If anyone has questions, direct them to the references and tell them, DO THE RESEARCH! Updated to include the UCC Filings: Creator’s End Game Agreement and Eternal Essence Embodied. Also includes information and links to Courtesy Notices. This site is well done and is the platform for learning everything about OPPT! Links are provided for presentations, conference calls, articles and opinions since the OFFICIAL ANNOUNCEMENT on 12/25/12. This presentation about the One Peoples Public Trust (OPPT) (Rev 3.3) can be used for educating yourself, sharing with other individuals, or make a professional presentation to large groups. I promise you, you’ll look like a professional! If anyone has questions, direct them to the references and tell them, DO THE RESEARCH! The People’s Trust is truly the PEOPLE’s, as in Every Single People On This Planet’s Trust. There is no head, there is no spokesman, woman, person, alien, or fish. There is Everyone! We are One with the Creator. We are One with Each Other.